We’ve already analyzed the 2014 ice bucket phenomena so let’s step into the way back machine and dissect three 2013 nonprofit campaigns that went viral in social media and consider the campaign characteristics that appealed to viewers’ psychies. In 2013, the three campaigns below generated massive awareness and often donations for the non-profits. While the vast majority of online campaigns generate a donation trickle, these campaigns magically sparked viewers to take action and/or donate, and forward the campaign media to their friends and family. Certainly no campaign for a carbon tax, or probably for global warming in general, has generated this amount of attention in social media. Water is Life repurposed the hashtag #FirstWorldProblems. In a video, third world people complain about their (non-existent) first world problems. It takes the word ‘irony’ to a whole new level. The result is simultaneously poignant and uplifting. Six million views on youtube. UNICEF polio vaccine directly and boldly called out their social media followers. “Hey, a ‘like’ on facebook does not help us to vaccinate children. So donate.” For four euros, we can vaccinate 12 children, and maybe save their lives. In several videos and images. American Red Cross took part in National Preparedness Month, jumping in on the hashtag #NPM13. The Red Cross helps with disaster relief and emergencies, so it was a good match and raised awareness with thousands of people in social media. In one funny graphic, there are twelve items, each marked as either useful, or not useful in an emergency. Got nunchuks? Let’s enumerate the main characteristics of the three campaigns. These three successful campaigns have many attributes in common. Melding the commonalities, a successful carbon tax campaign should: (1) feature victims that are people (not plants or ice caps or polar bears), (2) be funny and/or ironic, (3) be thought-provoking, and (4) be sensible and cost-effective. 1. Victims are people – Best choice is likely the next generation – today’s kids who will be parents grandparents, and voters when climate disruptions become catastrophic. The campaign pictures and/or videos should present a future with more frequent disasters, more severe weather, and offers less access to water, food, transportation, shelter, and clothing. 2. Funny and/or ironic – The victims and future in 1 above, must be presented in a humorous and/or ironic setting, scenario, or script. The tag line might be, “a pollution tax paid to our children”. What would a kid do with a stack of $5000 checks? Go to college? Buy an EV? There was a funny tweet recently, “Experts say, ‘ebola is under control”. “Public reaction: panic”. “Experts say, ‘global warming will be catastrophic”, “Public reaction: ‘pass me some more coal'”. This type of exchange expresses the right kind of humor and irony. 3. Thought provoking – The resulting image or video should include an analogy, metaphor, allegory, or paradox. 4. Sensible and cost effective – The solution presented should be easy to grasp, be immediately logical and satisfying, and be obviously affordable. “Economists agree that a carbon fee with 100% refund is the cheapest, simplest, fastest, and by far, most effective way to reduce green house gas emissions. Tell your members of Congress”. But what are viewers supposed to do? The ‘Years’ call-to-action is not in the episode, its on the show’s web site, under the heading, “What can we do“. The web page says that renewable energy is good, efficiency & recycling are important, and reducing our carbon footprint is virtuous. However, the big bold top-of-the-heap solution to global warming is to put a price on carbon. This solutions’ simplicity, effectiveness, and importance are explained in a whiteboard presentation by US Labor Secretary Robert Reich and in an interview with President Obama about pricing carbon. In a sidebar is a textbox labeled, “Tell your elected officials to put a price on carbon, you can take action on climate change in jut a few clicks“. Viewers are invited to enter their zip code to identify their elected officials, and then to tweet and/or email the members of Congress, asking for a price on carbon. I happened upon this mobilization campaign when one of the ‘Years’ producers tweeted that its generating a lot of twitter traffic at Congress. Let’s apply the CarbonTax Workshop (CTW) metric to ‘Years’ put a price on carbon campaign. The Years campaign does a good job communicating the need for a price on carbon. The Reich video explains how a carbon tax works, and that it is a market-based approach. There is no mention of cap-and-trade. Score: 10. The Years campaign makes it simple and painless to lobby Congress using familiar tools like email and twitter. The campaign tells viewers to ask Congress for a, “Price on Carbon”. This could be interpreted as cap and trade. It would be better if viewers were instructed to ask for a revenue-neutral carbon tax, as explained in Reich’s video. Score 7. The ‘Years’ tweet/email campaign is easily accessible on the ‘Years’ website, and the Reich video was released on Vimeo on 9/21/14. As of 10/1/14, the video has a respectable 4,400 views. We don’t know how many tweets/emails have been sent. CarbonTax Workshop believes that ‘Years’ should move the “Put a Price on Carbon” section to the center of the home screen above the fold, and advertise the Reich video to push view counts up into the millions. Score: 7. Celebrity interviewer talks to university researchers who have polled citizens with the questions, ‘should companies pay a fee to pollute the air’, ‘should the government implement a national climate policy’, ‘should there be a national fee on greenhouse gas emissions’. Celebrity interviewer talks to economists and elected officials in countries where a carbon tax has been in effect for ten years. Voila. It works. Former U.S. Vice President Al Gore’s The Climate Reality Project (TCRP) is an umbrella organization with nine major initiatives. One TCRP Initiative, ‘People versus Carbon‘, mobilizes individuals to build inertia for the Environmental Protection Agencys’, and other local, state and federal efforts, to regulate carbon pollution. “People versus Carbon” asserts that regulation is an important first step towards putting a price on carbon. TCRP “People vs Carbon” web site is divided into seven sections, five of which are informational and petitions. The remaining two are videos that analyze and advocate a path to a market-based #PriceOnCarbon. The one-minute “Cost of Carbon” video discusses the political price of climate denial – voters have the power to elect and re-elect candidates running on a bold climate action platform, and to not vote for climate policy blockers and deniers of science. The price of climate science denial could and should be expulsion from public office. “The Way Forward” is a six minute video that examines two market-based policies for reducing carbon emissions (solutions to pollution), a carbon tax, and cap-and-trade. A carbon tax and cap-and-trade seem interchangeable in this video, which we know from Hsu’s seminal book, “A Case for a Carbon Tax“, they are not. A carbon tax is simpler, cheaper, quicker, and vastly more effective than cap-and-trade. Attractive to conservatives in Congress, a revenue-neutral carbon tax refunds 100% of proceeds to citizens, so the funds cannot disappear into special interests or a larger government. As the carbon tax increases stepwise over time, the refunds increase proportionately, so higher taxes do not cause pain and protest. TCRP “The Way Forward” video does a good job communicating the need for a price on carbon. The video explains how a carbon tax works, and that it is a market-based approach. The TCRP video mistakenly gives cap-and-trade equal weight. Score: 8. The TCRP “Cost of Carbon” video does a good job explaining that deniers of science do not belong in elected office. If you, Mr./Ms. Member of Congress, are not helping to reduce carbon pollution, you are not doing your job, and your cost is that I will vote you out of office. A carbon tax ultimatum would be even better. Score: 8. TCRP videos are freely available on youtube and as of 9/26/14, the two short videos have a respectable 10,000 views each. CarbonTax Workshop believes that TCRP’s highest priority initiative should be, “People versus Carbon” and a big media marketing campaign to push the two video view counts up into the millions. Score: 8. Overall, TCRP “People versus Carbon” earns an excellent score of 24 on the CTW metric. To make the initiative more powerful, TCRP should combine the key messages from the two TCRP videos, “The Way Forward”, and “Cost of Carbon”, into a single video. The key message of this new video would be, “in your election, or re-election, Mr./Ms. 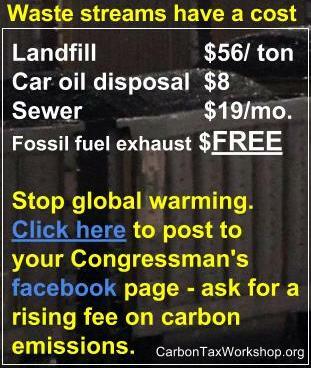 Congressman, my vote is contingent upon you introducing or supporting a carbon tax bill”. To keep errors of fact off of the letters page. submissions that say, “… there’s no sign humans have caused climate change“, do not get printed, says Los Angeles Times editor Paul Thornton. Elected officials should have a similar statement in their job description. “In this job, you will determine the future ability of the earth to support human civilization. If you don’t believe in global warming and that people are the primary cause, resign now, this job is not for you”. NextGen applies polls, data mining, and social media to identify climate-sensitive citizens and then launches television attack ads, door to door canvassing, and other media campaigns to mobilize these voters. To receive support from NextGen, candidates must support “bold action”, to battle global warming. NextGen is focused on elections in seven states, Maine, Michigan, Florida, Pennsylvania, Iowa, New Hampshire, and Colorado. NextGen’s definition of, “bold action”, is vague, but the only scalable options proposed in past Congressional sessions were a carbon tax bill and a cap and trade bill. The 2014 Managed Carbon Price Act by Rep. Jim McDermott (D-Wash.) is a carbon tax, and the American Clean Energy and Security Act of 2009 (also known as Waxman-Markey) was cap and trade. Charles Komanoff’s op-ed in today’s InsideClimateNews argues beyond all reasonable doubt that cap-and-trade is not bold action. At the state level, renewable portfolio standards, fossil fuels regulation, solar subsidies, and increased funding for renewable energy research, are important, but are not of sufficient scale in the time frame available. A carbon tax is the only bold action that scales to the monumental size of the fossil fuels problem. Moving on. Let’s apply the CarbonTax Workshop (CTW) metric to NextGenClimate. NextGenClimate does a good job communicating the need for bold action on global warming, but does not define ‘bold action’, which, to be quickly effective at the global scale, must be a carbon tax. Score: 4. NextGenClimate has mobilized thousands of voters to support bold climate action candidates. Score: 10. NextGenClimate is highly visible in the press, on the web, and on TV, and has raised awareness among thousands of voters. The organization has a paid staff of twenty and hundreds of volunteers, mostly in the key election states, mentioned above. Score: 10. Overall CTW score is 24. NextGen reportedly has a budget over one hundred million dollars, which calculates to approximately $14M per candidate. Let’s hope that is enough. Recordable and easily replicable. But not sufficiently funny or daring. Originating sometime in the past year or two, the history of the ALS Ice Bucket Challenge is a bit murky. We know that somehow self-refrigeration evolved when a few nutty individuals challenged their friends to benefit one deserving charity or another, and millions of soaked philanthropists later, we have perfect hindsight on the tsunami of viral fund raising. What do you suppose were the key factors that melded and ignited viral growth in the historical blink of an eye? And could these factors be combined again to bring attention and donations to another cause such as global warming? Fun, funny, clever, and marginally daring – The ice bucket challenge is fun to do, funny to watch, and judging by one’s heartrate, seems a little bit dangerous. Accessible, simple, and easy to copy with materials on hand requiring no preparation or shopping, An challenger can recruit a camera man, fill a bucket with ice water, and post the video for all the world to see in less than ten minutes. Compelling cause, doing the right thing. ALS disease is bad. Everybody knows it. Any small donation of time, money, or video gives the challenger a warm feeling. Recordable, automatic social proof. High resolution video cameras are so ubiquitous, one might expect a free one with a tank of gas. A youtube video is proof beyond doubt that the challenger fullfilled their side of the bargain and made a positive contribution to a compelling charity. Associates the challenger with influencers and the right crowd doing a positive thing. Millions of people have taken the challenge. Not self soaking is almost weird. Counting one’s own name among the names of neighbors, friends, family, influencers, and celebrities, creates a sense of community. An on-line meetup with everyone the challenger knows and potentially others the challenger would like to know. To investigate further, I wrote a script that mimics the ice bucket challenge — with climate as the cause — and recorded a video viewable here. I achieved a couple of the factors above, but i clearly missed the fun, funny, and daring factors. And until someone copies it, I have no sense of community bucketeership. How did i miss the fun, funny, and daring factors ? Social media is almost always fun. Making movies, taking photos, and sharing those with friends, relatives, and sometimes a large network of followers is fun in itself. Watching other peoples’ clever, thoughtful, well-planned, or well-executed media offerings is fun. Simple is better than complex. Mustn’t require much background. Better if the watcher can relate the media to their own life. My video is too complex and insufficiently clever. A slightly embarrassing or awkward situation is funny. Self deprecation is funny. Sea level rise devouring a large polluting company might be funny. Or maybe just ironic. My video is too serious; I don’t get soaked or embarrassed. Daring seems easier. An individual sharing a selfie photo or video of the individual advocating a carbon tax to a stranger could be daring. Wearing something carbon tax related or dressing as a carbon atom for a month is daring. Daring is absent in my video. 2. Post on their Facebook page. Go to your House of Representatives Facebook page or your Senators’ Facebook page. Companies should not be allowed to pollute the air for free. Global warming is a problem. I strongly encourage you to support a fee on carbon pollution with 100% of proceeds returned to taxpayers. The National Climate Assessment released by the White House on 06 May 2014 anticipates accelerated climate disruption in the future if global carbon emissions continue to surge unchecked. Luckily, there is an unassuming champion poised to unleash their political mojo at a scale that could finally start to level off and decrease emissions. That champion is the global insurance industry, whose solvency is jeopardized by extreme weather events. State insurance regulators, insurance trade organizations, and insurers themselves are pooling their mojo to lobby for climate legislation that would preserve the industry’s global position as 2nd largest, with US$4.5 trillion in annual revenue and US$25 trillion in total global investments. Through a series of international meetings starting in 1992, insurers came to realize that extreme weather events could trigger more insurance claims than insurers have the capacity to pay, and in the long term global climate disruption could bankrupt the entire industry. In 2008, insurance industry analysts rated climate change their number one strategic threat. Deteriorating insurer financials will initiate a negative feedback loop by reducing customer confidence, decreasing insurance policy sales and further damaging insurer financials. To make matters worse, some businesses that buy insurance are carbon-intensive and could be seen as responsible and liable for causing global climate disruption, thus increasing insurer payout exposure. Global insurers are rallying to reduce their exposure and to include climate disruption in their risk assessments and investment criteria. Many insurers have signed the Statement of Environmental Commitment by the Insurance Industry, which commits the insurer signatories to work together with governments to identify solutions for air pollution and global climate disruption. Most economists and many governments agree that the fastest, cheapest, simplest, and most effective climate policy is a carbon tax on corporate polluters with the proceeds of the tax returned to the taxpayers as income tax reductions. Deployed successfully in a dozen countries, such a revenue-neutral carbon tax could be developed by governments working together with corporations including insurers. European insurers and reinsurers (the large companies that insure insurance companies) have redirected their focus from climate adaptation to climate mitigation by advocating legislation that reduces carbon emissions. Following the lead of their European counterparts, a small cadre of U.S. insurers have quietly lobbied the U.S. Congress for climate legislation over the past few years. Insurance trade organizations provide legal, financial, education, and advocacy services for their insurer members. Developing guidance for business continuity and advocating climate legislation now consume an increasing part of these services. The chief insurance regulators of each U.S. state are called commissioners and the National Association of Insurance Commissioners is a trade organization that works to increase the resilience of the insurance industry. NAIC president Sandy Praeger, writes, “Nearly anything that is insured … is vulnerable to weather-related events.” If insurers suddenly received claims, not just on the seven trillion dollars worth of hurricane-prone U.S. East and Gulf Coast properties, but on a majority of policies, the industry would become insolvent. The trade organization Reinsurance Association of America (RAA) strives to promote a globally competitive and financially robust reinsurance industry. In mid 2013, RAA President Frank Nutter testified before the U.S. Congress explaining that the insurance industry can only be effective as an enabler of change, “if the regulatory and legislative framework establishes the right incentives for emissions reduction and adaptation on a global scale.” Simply put, insurers will be unable to scale up extreme weather loss coverages if governments fail to enact climate legislation and reign in future climate disruption. U.S. state insurance regulators’ mission is to impose standardized rules on the business of insurance, work to maintain the availability and affordability of insurance for customers, and guard against insurer bankruptcy. Insurer Munich Re estimates that U.S. weather related losses increased nearly fourfold since 1980, with over a half trillion dollars of losses from extreme weather between 1980 to 2012. The United Nations Environment Programme estimates that losses could hit a trillion dollars per year by 2040. NAIC President Sandy Praeger comments, “State insurance regulators are aggressively moving forward to influence greater industry attention and action.” To avoid a total failure of their mission, regulators have also started to advocate state and federal climate legislation, and are urging insurers to do likewise. Insurer, trade organization, and regulatory studies have all arrived at the same conclusion. Governments must enact strong climate legislation if the insurance industry is to remain intact. Maurice “Hank” Greenberg, the former Chairman and CEO of AIG, the world’s largest insurance company, said in late 2013, “Climate change is real, and you don’t risk the solvency of your company by saying, ‘I don’t believe it’. A scenario more likely than failure is that the large insurers would stop offering coverage for weather or disaster related claims. In an age of increasing disasters, this scenario is undesirable, and insurers can only narrow coverages for so long before climate disruption outpaces the insurers ability to downsize policies. The stability of the industry is correlated to the stability of the climate. U.S. insurers have political clout. They spent $1.8 billion over the past twelve years lobbying the U.S. Congress, primarily on health insurance issues. Urged by regulators, commissioners, executives, board members, shareholder resolutions, trade organizations, and customers, many insurers will be compelled to re-direct their political mojo to lobby for climate legislation in the U.S. Congress. Triple the budget of the fossil fuel lobby, a big influx of insurance lobby spending would unarguably: increase the priority of climate legislation such as a revenue-neutral carbon tax, reduce carbon emissions, and stabilize the insurance industry.